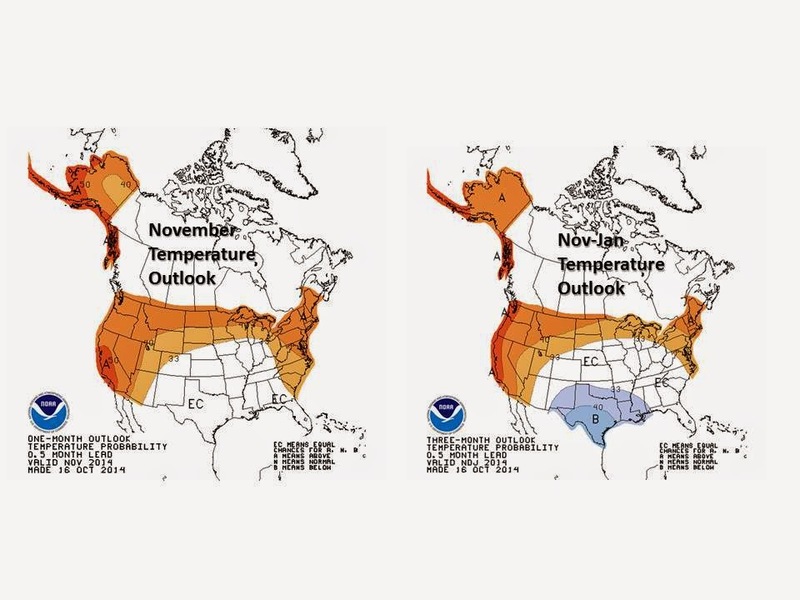 The NOAA Climate Prediction Center released new seasonal climate outlooks on Thursday (Oct 16) of this week. The outlooks for November through January and for December through February favor warmer than normal temperature conditions for the western states, the northern plains states, northern Great Lakes (including most of Minnesota), and northeastern states. This outlook is in direct conflict with what the Farmer's Almanac issued earlier the autumn, which called for another long, frigid, and snowy winter for Minnesota. Detailed in the narrative of the new seasonal outlook is the notion that the first half of winter has a higher probability for warmth than the second half of winter in our area. This is partially exemplified in the outlook for the month of November alone, which shows a stronger signature for being warmer than normal. The outlook for precipitation from November through February across the Great Lakes generally favors drier than normal, except for large portions of Minnesota which are designated to have equal chances for wetter or drier than normal conditions to prevail. As a footnote the medium range models certainly depict that the rest of October will be warmer than normal and drier than normal over most of the state. This week brought warmth and very dry air as well with afternoon relative humidity readings on Wednesday (Oct 15) of just 32 percent at MSP, 24 percent at Pipestone, 22 percent at Fergus Falls, and 21 percent at Fairmont. We have spoken a number of times about the effects that Lake Superior has on the north shore climate of Minnesota. It clearly affects the temperature, wind, precipitation (rain and snow), and cloudiness of north shore communities like Two Harbors, Grand Marais, Grand Portage, Knife River, and Beaver Bay. But how about the climate over the lake itself? Thanks to the NOAA National Data Buoy Center (the deployment of instrumented buoys on Lake Superior has occurred during our lifetime), and the work of the University of Minnesota Large Lakes Observatory (notably Dr. Jay Austin and colleagues), we are learning more about the climate patterns over the lake itself. Some examples.....Because water absorbs and surrenders heat energy quite slowly compared to land, the range and variation in monthly temperatures is quite out of phase with the land-based climate stations along the north shore. Average water temperatures in October are warmer than those of June as a result of the time lag effect of summer warming. Maximum water temperatures, ranging from 55 to 65 F typically occur in August, sometimes even early September. The land stations show maximum air temperature values in July. The coldest air temperatures on land occur in January and are often well below zero F, while the coldest the lake ever gets is about 332-34 degrees F, a temperature it may hold steady for most of the late winter and even into the month of May. The windiest month on the lake is November (remember the gales of November) with winds of 20 mph or more common in that month, and gusts well over 40 mph. Expectedly, the maximum wave heights also occur in November, with occasional extreme values over 15 ft. The maximum difference between air temperature and water temperature occurs in the months of November and December, when the air temperature may be as much as 20-25 degrees F colder than the water, and in June when the air temperature may be as much as 15 to 20 degrees F warmer. Dr. Harold Brooks and colleagues from the NOAA National Severe Storms Laboratory in Oklahoma published a paper this week in Science which documents increased variability in the number of annual tornadoes in the USA, along with increased variability in the start date of the tornado season. Overall, there has been a decrease in the number of tornado days, but total number of tornadoes has changed little. Dr. Brooks will be a keynote speaker at the upcoming Second Conference on Climate Adaptation ("Building Minnesota's Capacity for Climate Adaptation") to be held on November 6, 2014 at the Hyatt in downtown Minneapolis. There is a great lineup of other speakers for this conference. Topics will include natural resources, agriculture, urban planning, public health, recreation and tourism, and many other areas impacted by climate change. The regional climate project known as Useful to Usable (U2U) has developed a visualization tool to examine the geographic distributions of monthly climatic patterns associated with El Nino, La Nina, and Arctic Oscillation features of the climate. It is handy to examine which months are most affected by these climate features and how the patterns are distributed geographically. I encourage you to give it a try. Resilient Chicago, Climate Planning for the Future was a statewide meeting held in Chicago earlier this autumn to hear about climate trends and climate adaptation practices. Many other states and cities are hosting such meetings. Record warmth in northern Alaska was reported for the month of September and for much of the 2014 summer in a report released by NOAA this week. George Mason University will host an international conference next week on Weather and Climate Extremes, Food Security and Biodiversity. The conference will take place in Washington, D.C. over October 20-24. Hurricane Gonzalo was gaining strength in the North Atlantic Ocean this week and heading towards Bermuda. Sustained winds over 145 mph and a very wide band of showers and thunderstorms were associated with this storm on Thursday (Oct 16) as it moved north in the Atlantic. Though weakened it will still be a powerful hurricane when it moves toward Bermuda Friday night. The weather in the Pacific Ocean was relatively quiet except for Tropical Storm Ana which was moving towards Hawaii. This storm is likely to bring some rain and high surf to the islands over the coming weekend. I have only lived in Minnesota a few years, but my neighbor tells me that the thunderstorm season all but ends in November. In Arkansas we would still get some heavy duty thunderstorms in November bringing 3 to 4 inch rains. Have you ever had such storms here in November? By far the greatest November thunderstorm in Minnesota history occurred over Thanksgiving (Nov 26) in 1896. This storm brought high winds, hail, and heavy rainfall to many areas. Worthington received almost 5 inches of rain while several other locations reported 3 to 4 inches, including Farmington, Le Sueur, New Ulm, Shakopee, and St Paul. The storms were followed by cool weather, with snow. MSP weather records for this date include: highest daily maximum temperature of 84 degrees F in 1910; lowest daily maximum temperature of 33 degrees F in 1880 and 1930; lowest daily minimum temperature is 22 degrees F in 1948 and 1952; highest daily minimum temperature of 62 F in 1910 and 1953; record precipitation of 1.24 inches in 1879; and record snowfall is a trace in 1925 and 1990. Average dew point for October 17th is 38 degrees F, with a maximum of 66 degrees F in 1994 and a minimum of 8 degrees F in 1948. The state record high temperature for this date is 90 degrees F at Moorhead (Clay County), Long Prairie (Todd County), Campbell (Wilkin County), and Beardsley (Big Stone County) in 1910. The state record low temperature for this date is 2 degrees F at Bemidji (Beltrami County) and Cass Lake (Cass County) in 1952. State record precipitation for this date is 4.02 inches at Georgetown (Clay County) in 1971; and the state record snowfall for this date is 7.0 inches at Cook (St Louis County) and Gunflint Lake (Cook County) in 1990. October 16-18, 1880 brought one of the heaviest early season snowfalls in Minnesota history to southwestern counties. The observer in Canby reported snow drifts up to 20 feet high, while the New Ulm observer measured 15 inches of snowfall. At Breckenridge the snow reduced visibility to near zero for a time. The snow storm shut down the railroads in southwestern counties for a period of days and was later documented in Laura Ingalls Wilder's story of The Long Winter. Warmest October 17th in state history occurred in 1910. Many locations reached a daytime high of 90 degrees F, while even the Iron Range communities like Virginia made it into the 80s F under bright sunny skies. A sharp cold front two days later dropped temperatures by 40 to 50 degrees F.
1952 brought the coldest October 17th in state history with morning lows in the single digits up north and just teens in the south. It was only 12 degrees F at Rosemount and 13 degrees F at Austin. Many observers also reported daytime highs no greater than 39 degrees F. The prolonged mid-month cold spell was alleviated on the 23rd when temperatures climbed into the 60s and 70s F.
Strong thunderstorms brought heavy rains to the western and northern portions of the state over October 16-17, 1971. The heavy rains brought a halt to the fall harvest season, as many observers reported over 2 inches. Ada, Fosston, Benson, and Georgetown reported over 3 inches of rain and resumption of harvest activity was delayed over a week. A storm brought a mixture of rain, freezing rain, and snow to Minnesota on October 17, 1990. Some areas received significant snowfalls including 4" at Ada, 3.6" as Hibbing, 3.5" at Big Falls, and 3.0" at Cotton. Gunflint Lake and Cook reported a record 7 inches. Cooler than normal temperatures to start the weekend, then warming up on Sunday to near normal temperatures. Small chance of showers in the north over the weekend, but dry elsewhere. Continued near normal to warmer than normal temperatures with dry weather through much of next week.